We talked about the release of Warhammer 40K’s sixth edition, but I haven’t really talked about it since. One of the reasons for that is that I haven’t had a chance to purchase the rule book yet. I knew it was coming, so I really should have planned better. I just haven’t had the disposable income to pick one up. 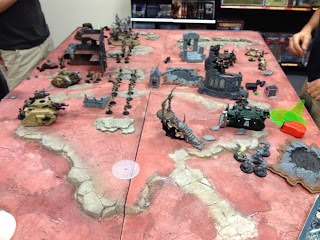 That did not stop me from getting to my local Games Workshop store this weekend and playing my in two small point value games. But would I even like the new rules? 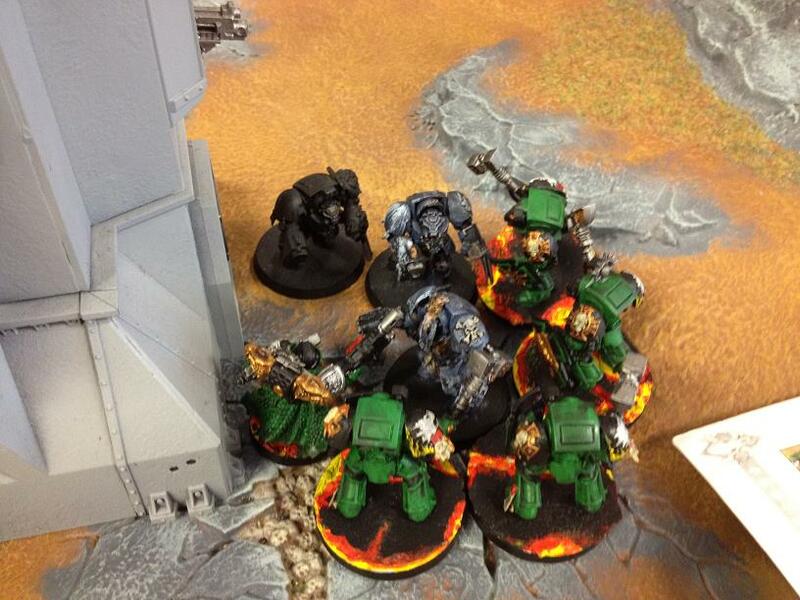 The first game I played was a one on one match against a Space Wolf player. He hadn’t really played many games of sixth edition either, so we both knew we’d be looking lots of things up while playing. It was a friendly relaxed game of war in the grim dark future. To get the technical stuff out of the way, we each had 700 points of figures. 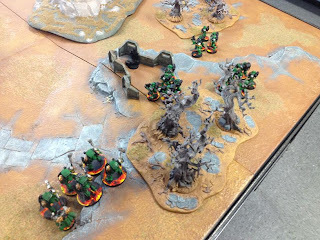 We played a three objective game with hammer and anvil deployment. 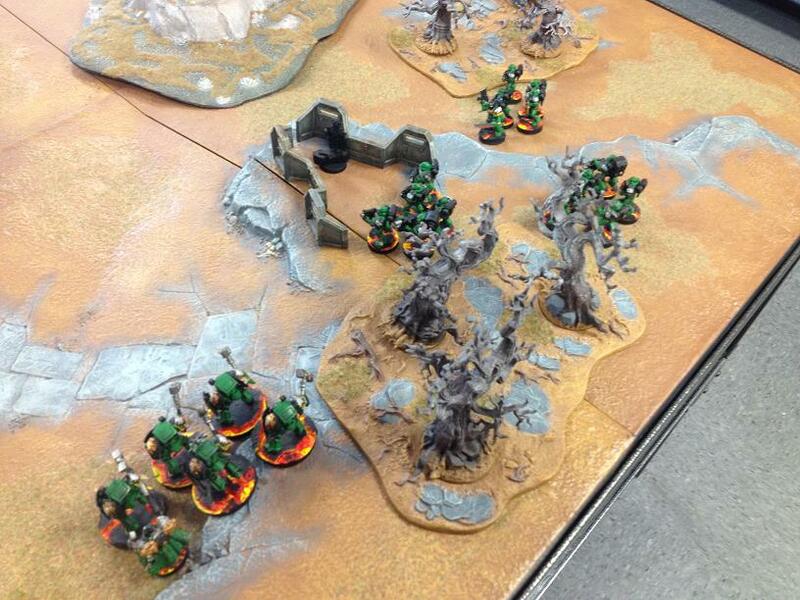 I was using my Salamanders and my opponent was playing Space Wolves. I had a blast. The new random objective powers turned out to be useful in two of the three situations. The random power I picked up from the Warlord traits actually came in handy at one point in the game. Shooting at buildings is fun, although my multi-melta was too far away to do serious damage to the tower. During the first two rounds of the game I really thought I was going to lose. I managed to turn it around though and my opponent conceded at the midpoint of turn five. I think my Captain challenging and killing Njal Stormcaller was the highpoint of the game for me. Our next game was a three way capture the flag battle. Both the Space Wolf player and I re-used the armies we had just played with. Our third player was a fantasy player who was jumping into 40K with a Grey Knight army. 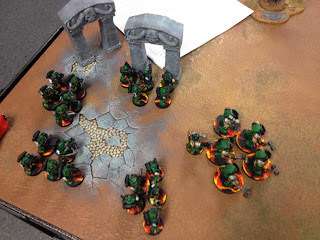 Since no one was really familiar with the Grey Knight rules, we messed them up pretty badly. We gave the Grey Knights a pretty big power boost that they don’t really have. The Grey Knight player won that game, but had we actually used the rules correctly it could have been anyone’s game. In the end, we all had fun though, so that was what mattered to us. Brandon and I will both be up at Games Day this weekend, so I’d expect a full write up on that sometime next week.